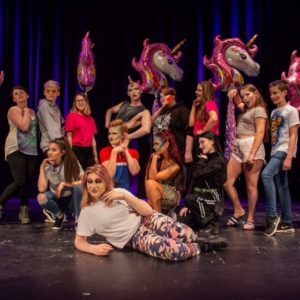 Each year The Customs House is taken over by emerging artists and arts professionals aged up to 25 years of age for a week of theatre, cinema, music, dance, poetry, hip hop and visual art. 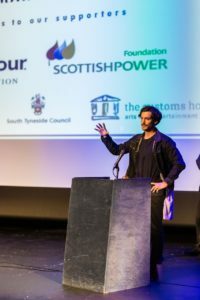 This year The Takeover is possible thanks to the generous support of The Scottish Power Foundation, W A Hanley Fund, The Barbour Trust, and The Community Foundation, Tyne and Wear and Northumberland. 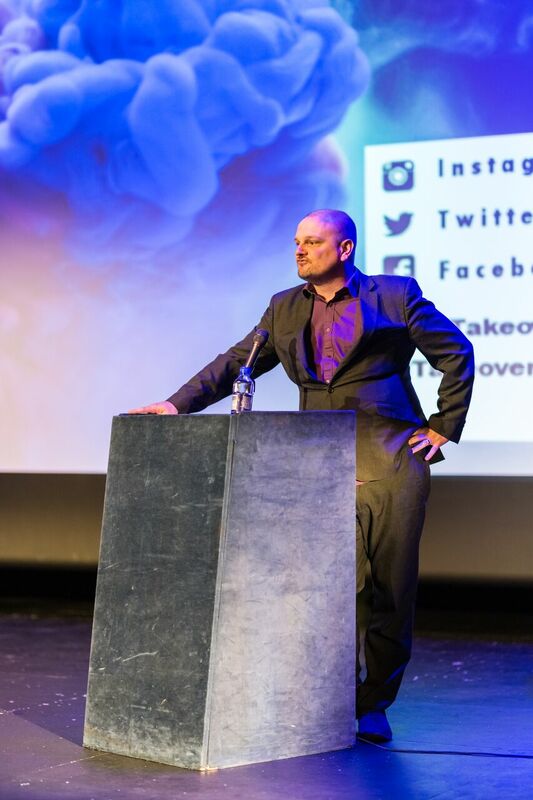 Read on to find out more about The Takeover’s highlights this year. On Monday we welcomed Cheddar Gorgeous to The Customs House. Cheddar traveled up from Manchester and led a drag masterclass with fifteen young people. Cheddar shared his experience of using makeup to express and explore his identity. The young people had the makeup, tools and time to try new things. We were delighted to bring this internationally recognised artist to The Customs House. Mini Makers and Mega Makers explored science and art. Parents were busy helping their children achieve a Discover Arts Award. Discover Arts Award is certified by Trinity College in London. Completing Arts Award in Mini Makers was a first and only possible thanks to our funders support. 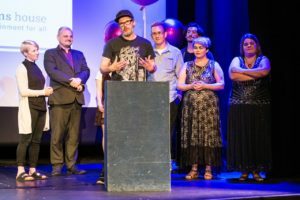 We’ve never been able to offer Arts Award in Mini Makers before. Lauryn Lamb from the Takeover Team and Jayden Blacklock were excited to help trial Arts Award in Mini Makers. Sophie and Ruby Ifenjuna who were first time visitors to Mini Maker said the best thing about the day was coming to The Customs House. We look forward to welcoming more new young people to Mini Makers in the summer holidays. Matt was keen that Lesley Guy our Gallery Learning Officer shared with the gathered crowd how it had been a difficult decision. Several pieces of artwork were highly commended. You can see the winning artworks as well as the other entries 31st August. Along with a certificate and art materials bundle Jessica Donnelly, our 19 to 25 winner, will also receive some mentoring before having a solo exhibition at The Customs House later this year. A special mention goes to all the parents and teachers who helped their young artists get organised and enter especially South Shields School, Whitburn Academy and Farringdon Community Academy who each submitted work on behalf of their students. You can also add to our Takeover drawing wall with your own sketches inspired by the exhibition. On Tuesday graffiti artist Mark Shields led a workshop. Each young artist produced their own canvass after developing their own unique design. Once again the workshop was oversubscribed so we’d recommend you come into The Customs House to pick up your pay what you decide tickets in advance to avoid disappointment for #TheTakeover19 (usually we announce the programme in mid May). You can see Mark’s work here: www.behance.net/markshields. 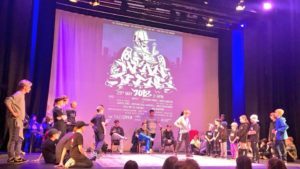 Joe Henderson our Takeover Team member worked with Just Jam International and Bad Taste Cru to bring us this year breakdance battle. This year’s battle moved to the main house in the theatre following huge crowds in 2017 Takeover. 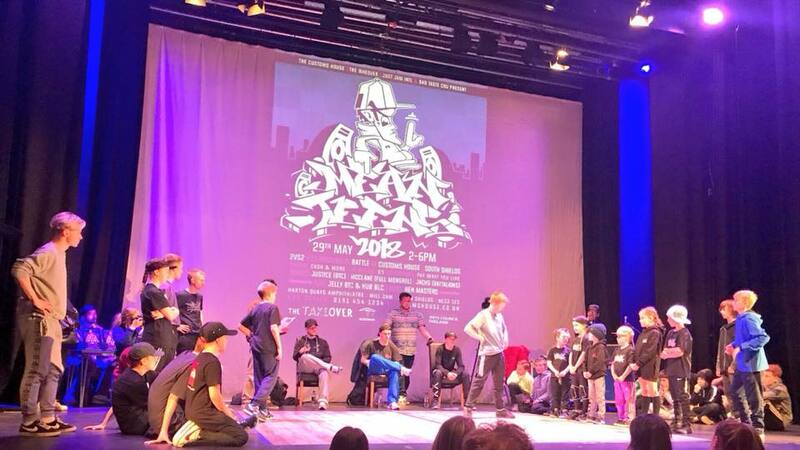 Bboy and bgirl break dancers came to compete the entire North East and beyond with a strong cru representing Leeds. Meen Teens. Thanks to Joe Henderson, Just Jam and Bad Taste Cru. Most Promising Newcomer was Bboy Noah (Newcastle). Ray Spencer The Customs House Executive Director popped in to see the battle and whilst he resisted the invitation to join P (aka Paul Martin) on stage! On Wednesday, The Takeover Team welcomed Heather McDonald from Scottish Power Foundation to The Customs House. Heather asked the team lots of questions about their experience. Lesley talked about actually being given real ownership of the project. Joe said, “We’re really responsible” a sentiment echoed by Megan. Lauryn said she wanted to continue volunteering helping with the gallery and Mini Makers. Later, Kay Greyson + Max Gavins Kay Greyson’s unique hip-hops sounds filled the Green Room. Kay spent some time chatting to The Takeover Team about how she got into writing, producing and performing. The Takeover Team and Kay Greyson. Photo by Wycombe 89 Media. 16 to 25 Lauren Aspery ‘My First Pair’. Winners made the front page of The Shields Gazette. You can pick up a free copy of the anthology at The Customs House and The Word. Act fast because when they’re gone they’re gone! The young poets joined us at Custom Space to record their poems. We will be publishing the anthology online and releasing the recording soon! Bo Buglass Receives Her Award. Photo by Billy Amann. Elizabeth Kane Learning Officer; Alistair Robinson host and judge; Lauren Aspery (winner); Heather McDonald (Scottish Power); and Tom Kelly Head Judge. Photo by Bill Amann. Finn really enjoyed it too (recording in the studio), thank you for sorting all these things out. The Takeovers are good opportunities for kids and adults, and let’s hope more people continue to enjoy them. 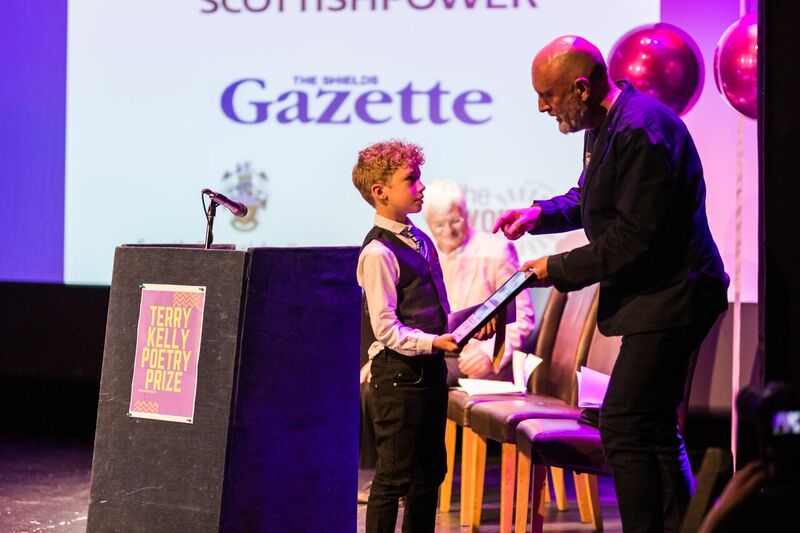 Today Finn was doing an assembly in his school about his award winning poetry, we hope he inspires more young writers. Finn Edmonds Receives His Award from Alistair Robinson. Photo by Billy Amann. Thursday was all about film with the North East Young Film Makers Awards. Lee Kyle local comedian played host with his usual mix of irreverent humour and warmth. Don’t forget you can see him perform here. 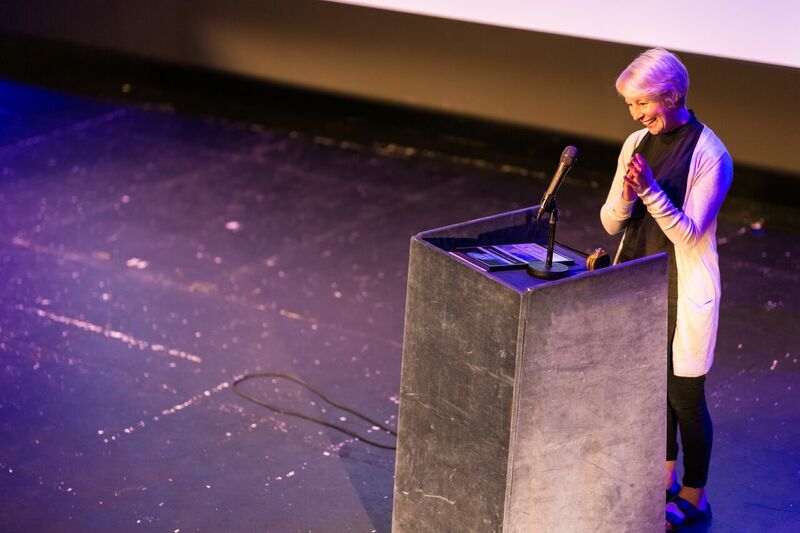 The judging panel included filmmaker and director James Coyle and animator Lesley-Anne Rose. 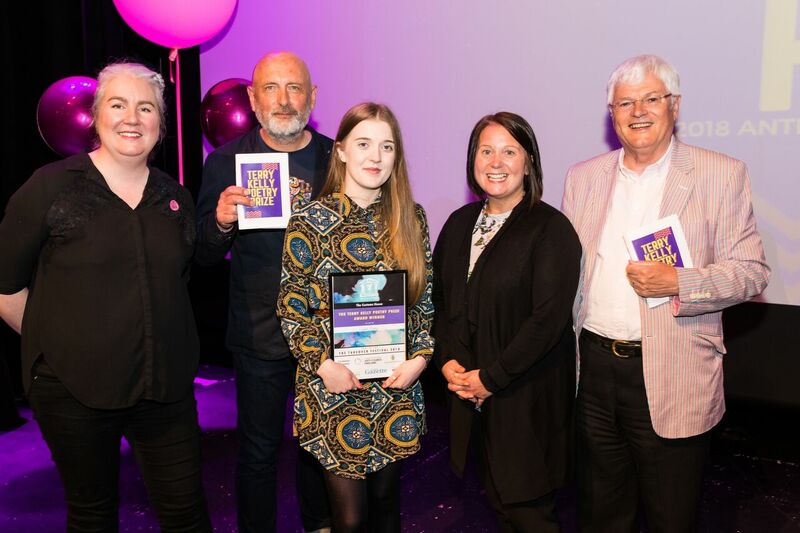 Importantly, it also included and last year’s North East Young Filmmaker Lauren McCaughey. Lee Kyle North East Young Filmmakers host. Photo by Billy Amann. James Coyle. Photo by Billy Amann. Lesley-Anne Rose. Photo by Billy Amann. 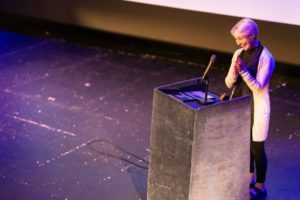 Altea Claveras was named North East Young Filmmaker 2018 for her film Nirvana. Tom Sayers with his film Fool Circle won the Best Cinematography category. Amos Menin, Fay Sharp, Sean Carlin, Issy De’Ath, Andrew Cockling, Gemma Kelly with their film Gills shared the best screenwriting award. Music Spark with E-Zombie took home the award for best sound and music. Best Sound and Music- Music Spark with the film E-Zombie. Photo by Billy Amann. 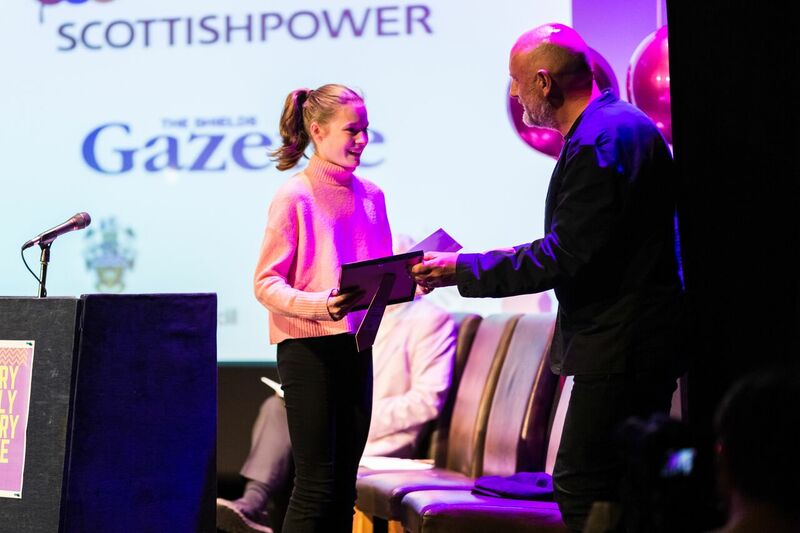 Izzy Finch Learning and Participation Officer at The Customs House impressed all the team with her organisation of the film awards and of The Takeover. It was a pretty hectic time to join the Learning and Participation Team. Now we couldn’t imagine it without her. Young performers took over the stage on Friday rounding off the week. 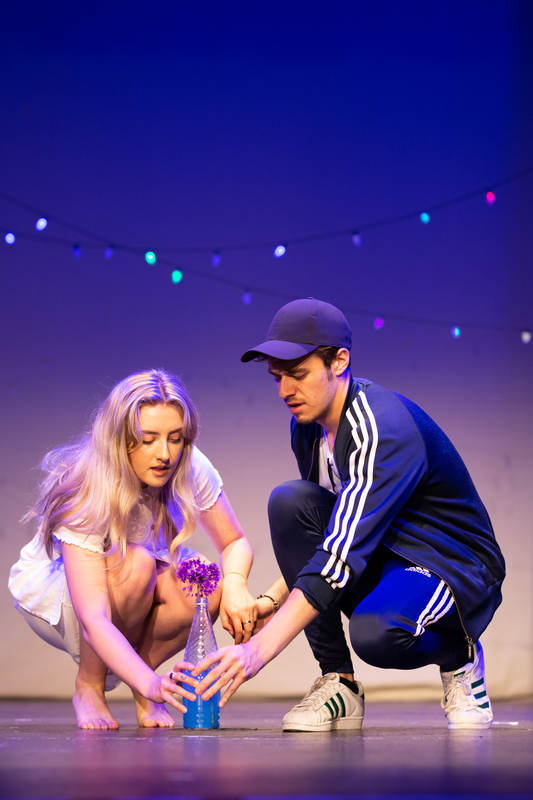 In the afternoon The Junior Youth Theatre performed ‘StereoTYPED’ written for the group by Laura Turner (BBC EastEnders: E20; Almeida Theatre; Associate Writer, Petersfield Shakespeare Festival; Chapterhouse Theatre Company). In the evening audiences enjoyed the packed out performance of WORMTOWN by Reece Connolly our first ‘Takeover Writer in Residence’. WORMTOWN was a comic re-imagining of the Lambton Worm into, ‘A new legend of misfits and monsters’. Reece Connolly is a North East-born and bred playwright and theatre-maker, and has been based in East London. Laura Turner acted a a writing mentor to Reece. Jake Smith directed WORMTOWN. He was also reponsible for casting. Jake Smith was a creative learning facilitator at Hull Truck Theatre, resident director at Almeida Theatre, trainee director at Chichester Festival Theatre, trained on the National Theatre Directors’ Programme and he is currently artistic director of Petersfield Shakespeare Festival Jake was previously nominated for Off West End Award for Best Director. All the players were under 25 and included many of the region’s best known up young performers namely Abigail Lawson, Lauren Waine, James Gladdon, Andrew Finnigan, Luke Maddison, Kema Sikazwe, Serena Ramsey and Daniel Watson. 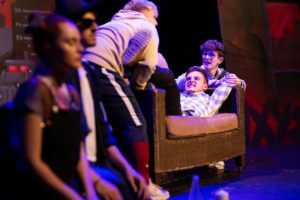 Many of the cast trained with The Customs House Youth Theatre or had their first professional paid role on stage here. When The Customs House brings together an exciting team of creative people great things like WORMTOWN happen. It’s perhaps easy to forget, this is due in part to great leadership from The Customs House Deputy Director Fiona Martin who was locked in the rehearsal room for most of the week too! Thank you for coming to support new writing and emerging talent. Lauren Waine as Cassie, James Gladdon as J, Luke Maddison as Scrum, Daniel Watson as Dad/Worm and Andrew Finnigan as Kezzy. Photo by Billy Amman. You have one more chance to see WORMTOWN at Alphabetti Theatre in Newcastle on 16th June. This will give some of our cast their first experience of touring regionally. Kub (BLC) aka Jacob Brown(who DJs at Ernest and TwentyEight in Newcastle) played to a packed Green Room in the AFTERPARTY. If you were there you know the funk and soul sounds kept the festival vibe going till late. And we continued to spread #TheTakeover18 joy donating our balloons to Northumberland Pride. Believe it or not we didn’t talk about everything here including Blowing a Hooley’s Improv workshop, Act to Cams session, the cosplay meet or The Takeover drawing wall. 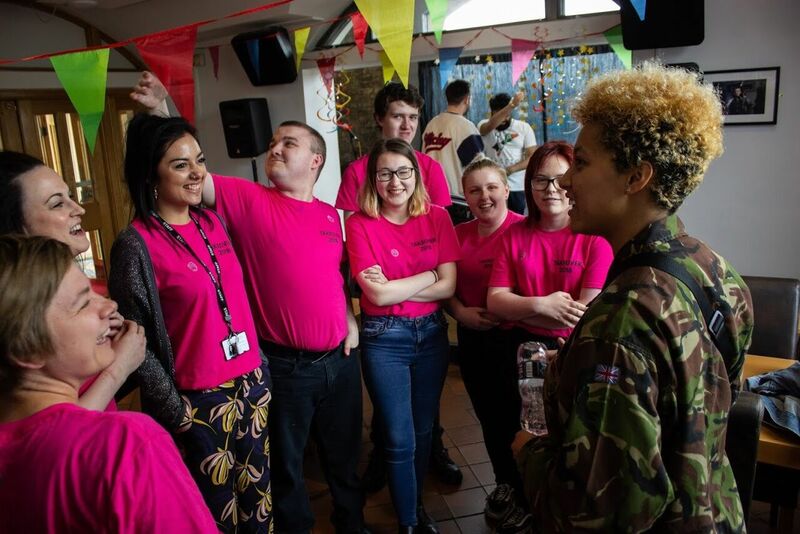 Thanks to everyone who took part, watched and supported or helped with this incredible week from all in the Learning and Participation Team at The Customs House. A special mention goes to Catherine Scott who heads up our Takeover team and Chris and Grant from Wycombe 89 Media who are busy producing our Takeover Film. Finally, we extend our thanks to Ray Spencer Executive Director, Jordan Embleton Technical Manager, the front of house and box office teams, The Green Room and our board for getting behind the festival and helping make it such a wonderful week.